question of security is a harder one to answer. On the one hand even smallest offices that connect to the internet should get the same level of safeguards as large offices but on the other hand professional security devices are expensive, their management is time consuming and IT security knowledge at small offices is scarce. 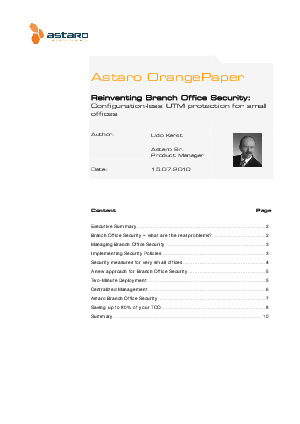 This Orange Paper is explaining a new approach for providing complete, affordable and easy to manage security to even smallest branch offices.